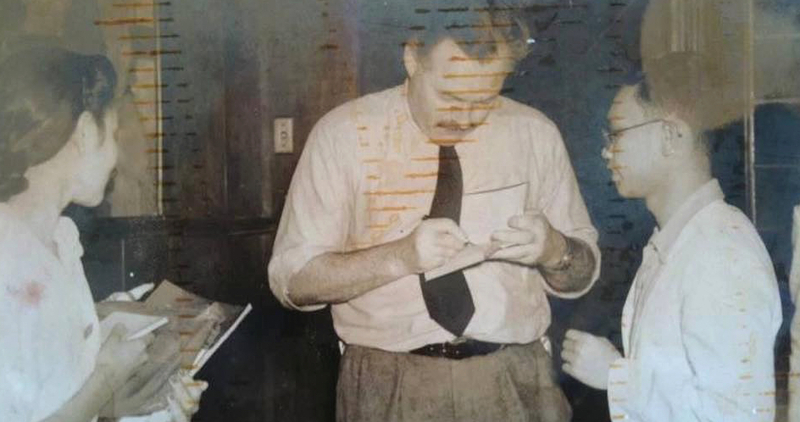 A COUPLE of months ago, I wrote a piece here about the Nobel prizewinning novelist Ernest Hemingway’s brief visit to Manila in February 1941. When my friend Dr. Erwin Tiongson read that, he sent me more materials about that brief encounter between the literary titan and his local readers, including a reference to a second visit by Hemingway on May 6, presumably on his way back to the US. I was, of course, attracted to that passage because it particularly mentioned Hemingway’s pen, which I would have dearly loved to see; but also, it talked about Hemingway signing books, which reminded me of a photograph I adverted to in my earlier column, showing Hemingway signing a book for a young Filipino writer named Nestor Vicente Madali Gonzalez, who in early 1941 would have been no more than 25 years old. I’d seen that picture in NVM’s house in UP when he was alive, and had worried that it might have been lost when the house burned down. But after my piece came out, I was happy to hear from NVM’s youngest daughter Lakshmi that she had posted a copy of it on her Facebook page, and I hope she doesn’t mind if I repost it here—Ernest meets Nestor, you might say. “NVM and I were born only 60 kilometers away from each other in Romblon—he on Romblon Island and I on neighboring Tablas—but also almost 40 years apart, and I never had the good fortune of being his student in UP. It’s actually my wife Beng who’s been closer to the Gonzalezes, having been Narita’s student at UP Elementary. But I had the chance to meet NVM and to enjoy his company when he returned to UP in the 1990s as International Writer-in-Residence under the auspices of what was then the UP Creative Writing Center. I had the honor of drafting his nomination as National Artist, signed by then Dean Josefina Agravante. “Franz Arcellana was my teacher, and Bienvenido Santos and Greg Brillantes were my literary models; but it was NVM who hung out with us, whom we had fun with in our workshops in Baguio and Davao. And as advanced as he was in years, he was forward-looking and eager to learn. I remember running into him once in what was then the SM North Cyberzone, and I asked him what he was doing there. ‘I’m looking for a book on multimedia!’ he told me with that twinkle in his eyes. The celebration of NVM’s centenary won’t stop with that dinner—which also saw the launch, by the way, of new books on NVM: his poems, edited by Gemino Abad, and a Filipino translation of Seven Hills Away by Edgardo Maranan, published by the UP Press and the Komisyon sa Wikang Filipino, respectively. At the end of this month, the UP Department of English and Comparative Literature will hold an exhibit of photographs of and works by him. His son Myke, based in the US, is organizing a fiction-writing workshop in January, the first half to take place in Diliman and the other in Mindoro, and the UPICW will be helping Myke out with that project. It never ceases to amaze me how a web of words (make that a Worldwide Web, these days) can bring people together across the miles and years. This entry was posted in America, Art & Culture, Pinoys, Travel, Writing and tagged Gonzalez, Hemingway, literature, Manila, NVM, Philippines by penmanila. Bookmark the permalink.